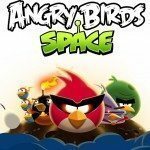 During SXSW both Samsung and Angry Birds maker Rovio were on hand to show off the upcoming Angry Birds Space game for mobile devices, and what we have for your viewing consideration below is a demonstration of Angry Birds Space playing nice on the Samsung Galaxy Note. The Angry Birds Space hands on demonstration on the Samsung Galaxy Note comes our way courtesy of the guys over at Phandroid and by way of The Verge who were at the event and managed to get a little hands on playtime with Angry Birds Space on the Galaxy Note. As Angry Birds fans will know, Angry Birds Space is the latest iteration of the hugely popular multi-platform game but this time round has a physics approach, and obviously takes place in outer space and thus makes use of gravitational forces to beat them pesky green pigs. In the video footage we learn that there is a NASA satellite available that you can click on to lean more about space, whilst each green pig inhabited planet is surrounded by a gravitational orbit with the Angry Birds outside that field, and if you fire a bird that doesn’t hit the gravitational orbit it will just shoot off into space, but if you fire into the gravitational field the trajectory of your bird will curve and hopefully destroy the pigs. Anyway as I am sure the Angry Birds faithful out there will know, Angry Birds Space is due to hit as of the 22nd of this month, so until then head on down and mash that play button to check out this Angry Birds Space demo on the Galaxy Note…enjoy.